A tempting sizzling sound greets you even before the Sizzler is served at the table, indicating the thumping fun that is in store for you! A sizzler is nothing short of a complete meal. There is no constraint on what can or cannot go into a sizzler; it is left to your imagination. From tikkis to veggies, noodles to rice, gravy to croutons, you can bring together all your favourite ingredients into a sizzler, keeping the portion size big enough to serve around two people. On days when you have time, you can make an exciting sizzler at home itself. You will need a sizzler plate. 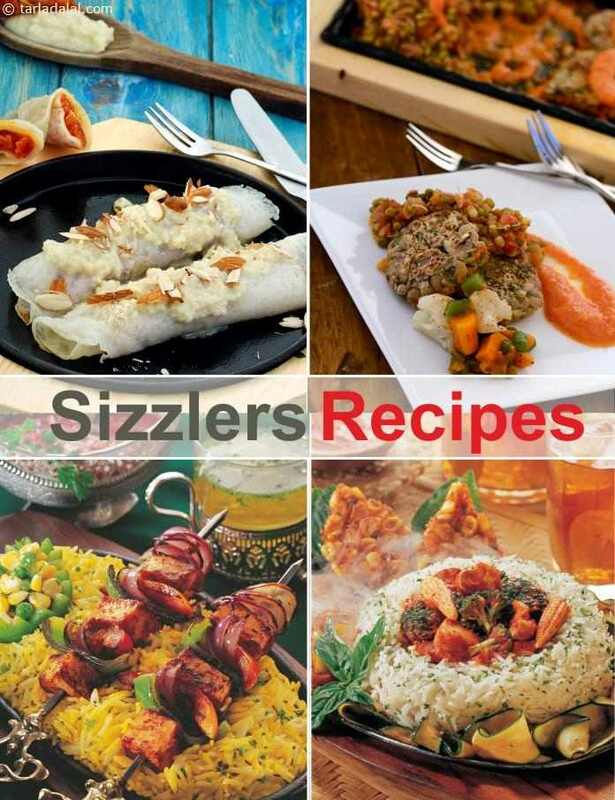 Once you have that, you can start off by exploring some of the inspiring recipes in this section like the Paneer Tikka Sizzler, Thai Sizzler, Italian Sizzler and Lebanese Sizzler. Chilli paneer sizzler is a vegetable barbeque recipe with paneer cubes marinated in delectable array of sauces and spices and then placed in a griller. The paneer sizzlers are easy to prepare and mouthwatering in taste. A perfect starter or cocktail snack item. In rainy season there are various religious fasting occasions so to make it delightfull this sizzler will be a treat a healthy treat.